Who destroyed the Ukrainian Army? After the declaration of independence in 1991, Ukraine inherited 800,000 forces from the Soviet Union. Not even in the worst nightmare could one imagine that 23 years later Ukraine would need to protect the right to its own existence and combat military aggression on its own territory with a force of 6,000 battle-ready soldiers and officers. In addition to a nearly million-strong army, Ukraine also inherited more than 6,100 tanks, 8,000 armored vehicles and 1,100 aircraft. The quantity and quality of heavy weapons in the Ukrainian Army were second only to American, Russian and Chinese armaments. In just two decades, this armada was “optimized”, “reduced”, “reformed” and “restructured” to a state of almost non-existent combat readiness. Thousands became rich through the destruction of the Ukrainian Armed Forces, but responsibility was shared by only a few individuals. So, what is the answer to our question? There is a clear answer, or rather… many answers, many names, decisions and inaction that led to catastrophic consequences. In our opinion, these names have been totally forgotten. We wish to remind our readers so that historical truth may be restored. President Leonid Kravchuk (first President of Ukraine-Ed.) laid the base for the collapse of the Armed Forces. Ukraine was in a hurry to get rid of its large army and went somewhat “too far”. The numbers were huge – the Verkhovna Rada decided to reduce the number of soldiers in the Army by 350,000, i.e. from 800,000 to 450,000. We wish to underline that we will not comment on political and economic conditions that influenced certain decisions; we will just assert facts. Leonid Kravchuk – during his presidency (December 1991 to July 1994), Ukraine effectively got rid of tactical and strategic nuclear weapons. Giving up the strategic arsenal was part of political bargaining, but the relocation of tactical warheads to Russia in December 1991 was essentially Kravchuk’s fault. Not only did he not do anything to prevent it, but he did not even know that this was actually being done! Another question concerned the division of the Soviet Black Sea Fleet. Ukraine’s position on this issue went from “division on an equal footing” to “15-20% of the ships”. The final figure – 18.3% – was decided under Kuchma. Inertia and the “withdrawal reflex” continued for some time, especially when senior military officials tasted easy money from the sale of “surplus property”. The army was cut to 310,000 soldiers. Oleksandr Kuzmuk (Minister 1996-2001). The Ukrainian aircraft carrier Varyag was sold at the price of scrap metal to China. The Chinese processed the “scrap”, and in 2011 launched it as the aircraft carrier Liaoning. In addition to inflicting direct losses, Kuzmuk also contributed to the deterioration of the army’s image at the international level. For two years, the Armed Forces were involved in scandals with deadly incidents. In 2000, a Ukrainian surface-surface missile hit a building in Brovari – an error during a training session. In 2001, a Ukrainian antiaircraft missile hit the passenger plane Tu-154 travelling from Tel Aviv to Novosibirsk. 78 people were killed. Kuzmuk continued to deny the involvement of the Ukrainian Armed Forces, but admitted the fact after undeniable evidence was produced. Volodymyr Shkidchenko (Minister 2001-2003). The potential flagship missile cruiser Ukrayina was moored and docked. This ship was powerful and technically advanced, similar to the flagship of the Russian Black Sea Fleet Moskva. As of 2002, the missile cruiser Ukrayina was 95% ready. However, nothing was done to finish it or sell it. It could have been sold, but the Russians offered too little. So, every year the government spent $1 million just to service and maintain the cruiser. Today, the rusty Ukrayina lies moored at the dock of the Mykolayiv Shipyard. Ukraine’s Euro-Atlantic integration meant bringing the army up to NATO standards. How should any new army reforms be implemented? Correct… more cuts. It was planned to cut another 100,000 soldiers from the army, leaving 210,000 servicemen. Anatoliy Hrytsenko (Minister 2005-2007). In 2007, the Ministry of Defense decided to outsource some activities of the Ukrainian Army, i.e. it allocated food supply to private hands. Thanks to various “kickback” schemes, the right to supply food to the Ministry was attributed to the “right” companies, and the “right” generals were thus able to improve and expand their homes and automobile collection. In addition, the fact that the soldiers were unable to prepare their own meals undermined the autonomy of the army. Faced with an emergency situation (early ATO stage), soldiers must depend on army ration packs (MRE meals), when food should be supplied by private firms. A long list of units to be dismantled was drawn up in 2007. However, military property was not sold by tender, but was, in fact, given away through “letters of renouncement”. The Ministry got rid of hundreds of hectares of land, including coastal territories (camp for military personnel children near Odessa). Of course, the authors of these “letters of renouncement” lined their pockets with a tidy sum. Valeriy Ivashchenko (Minister 2009-2010) was the first minister to be punished for corruption. This case involved the illegal sale of property belonging to the Feodosia Shipyard. Of course, Ivashchenko was imprisoned when Yanukovych came to power and decided organize a political “showdown” with his predecessors. After Viktor Yanukovych came to power in 2010, he announced a large-scale reform of the army, which would lead to a complete transition to contractual manning formation. Reformate confirms that President Yanukovych and his Ministers did the utmost to actually “finish off” the Ukrainian Armed Forces. Viktor Yanukovych (President 2010-February 2014) implemented further reduction of the Ukrainian Armed Forces (135,000 in 2014, bringing the number down to 70,000 by 2017) and abolished conscription. These decisions might have been appropriate if Ukraine had had a clear membership perspective in NATO. However, in terms of the government’s policy of non-alignment and insufficient social and material provisions to contract soldiers, such a move constituted an open “invitation” for foreign troops to enter Ukraine in any unstable situation. This is what actually happened. Mykhailo Yezhel (Minister of Defense – March 2010-February 2012). It was namely under Yezhel that the Ministry of Defense popularized different “write-off” schemes and transfers of ministry property for nothing. The most scandalous scheme involved the $100 million transfer of the Balaklava Shipyard Metalist to private hands. Mykhailo Maliarchuk – Yezhel’s Deputy, Head of the Central Administration for Communications and Information Systems at the Ministry of Defense. During his tenure, $6.5 million that were targeted for creating a safe radiocom system for the Ukrainian Armed Forces disappeared into thin air. This system, which is used in all major armies of the world, is not operational to date. Serhiy Hromov – former manager of Renat Akhmetov’s holding company Metinvest, Director of state-owned Ukroboronprom. The latest investigations launched by the Prosecutor General showed that many weapons and military equipment were lost to state enterprises that had been transferred from the Defense Ministry to Ukroboronprom in 2011. 17 member companies of the state consortium lost 189 automotive and armored vehicles, and 440 aircraft and artillery units and other equipment were dismantled. Losses from such “negligence of duty” totalled more than 27 million hryvnias. -1.1 billion hryvnias were allocated for the development of blueprints for the Sapsan missile system and the joint Ukrainian-Russian project to modernize the An-70 aircraft. After many years of work, all the funds were used up, whereas archeologists have yet to dig up the blueprints for these projects. Ministers Dmytro Salamatin and Pavlo Lebedev (February 2012-February 2014) are suspected of having ties to the GRU of the General Staff of the Armed Forces of the Russian Federation. Both ministers were born in Russia. Salamatin obtained Ukrainian citizenship in 2005. During their tenure, army units in Donetsk, Kharkiv and Luhansk were disbanded as unnecessary. They also planned to sell 56 thousand hectares of ministry land and over 30,000 units of military equipment. If these plans had been implemented, the Ukrainian Army would have been completely destroyed. The now-famous Maidan revolution suspended Yanukovych’s reforms, thus giving the Ukrainian Army another chance. In terms of modern military operations, Ukraine has now begun to create its own army almost “from scratch”, with some remnants of military equipment and officers. We can say, without exaggeration, that Ukraine’s success as a nation-state depends on the reconstruction of its army. It is in such mundane terms that the Ministry of Defense of Ukraine describes the catastrophic destruction of the Ukrainian Armed Forces in the last 23 years. No comment! 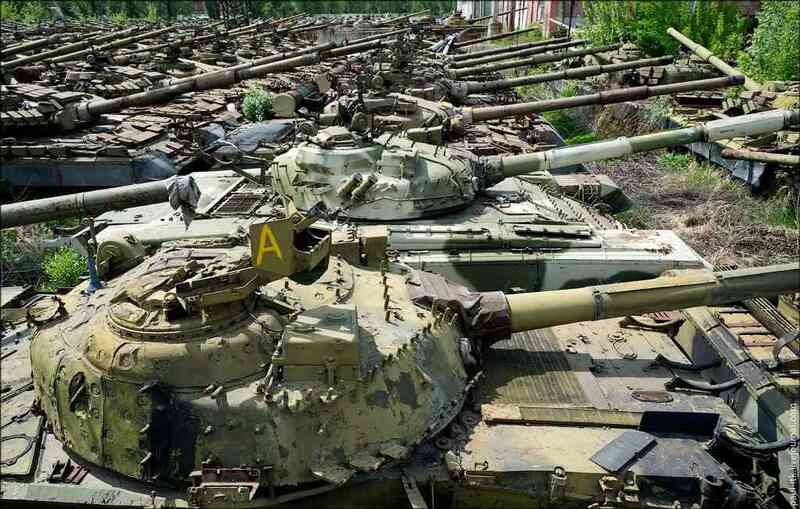 » Featured » Who destroyed the Ukrainian Army?